John Ryder (1971-2001) had a long and distinguished career as a typographer and book production manager in London, and was one of the last to work in commercial letterpress book production. From 1946 to 1957, he worked at Phoenix House Ltd. who published the first edition of Printing for Pleasure. In 1957, he was hired at The Bodley Head, a prestigious firm established in 1887, which published the revised edition in 1976 and where he principly worked until his retirement in 1987. 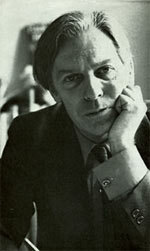 Mr Ryder was awarded a Fellowship of the Society of Industrial Artists and Designers in 1974, although he had not previously been a member. In December of that same year, he was honored with an exhibition* of his work at The Bodleian Library in Oxford. That exhibit titled “John Ryder, Designer & Art Director for The Bodley Head” featured his work for that firm, but also included earlier work while at Phoenix House, and examples from his private imprint the, Miniature Press. Many of the items displayed form the Bodleian’s John Ryder Collection, the repository for Mr Ryder’s personal and professional archives. The archive includes manuscripts, proofs, mock-ups, and his correspondences with pre-eminent designers, printers, publishers, and scholars, among them: David Godine, John Dreyfus, Giovanni Mardersteig, Ruari McLean, Reynolds Stone, and Jan Tschichold. Although this booklet lent important information to the present research, the wish is that an offset, color catalogue had been produced to show page spreads from the various titles cited. However, it does reprint, in various single spot colors, line illustrations from outstanding designers and illustrators of Mr Ryder’s association including Michael Harvey, John DePol, and Maurice Sendak. It also provides a checklist of over one hundred private presses and printers represented in the Ryder Collection including: Victor Hammer, the Officina Bodoni, Rampant Lion Press, Spiral Press, and Adrian Wilson. John Ryder Remembered by His Friends. London: Bertram Rota, 2001. The Times, London. January 25, 2001. Available at Richard-Gabriel Rummonds website.